The protective forest in Tay Ninh Province is being damaged as people seek ways to expand farmland. 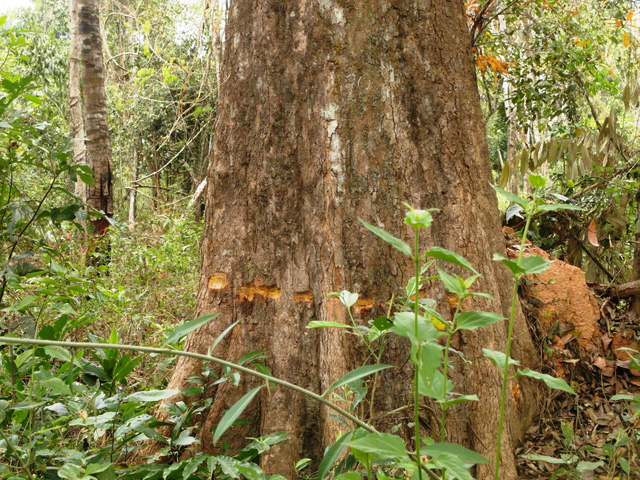 Mang Van Thoi, head of the Tay Ninh Forest Ranger Unit, said they were working with the management board of Dau Tieng Protective Forest to prosecute the case in which hundreds of trees are being damaged or poisoned. Since early this month, the forest ranger unit has discovered 124 trees of various types, with diameters of 10 to 45 cm damaged. The trees had drilled holes, scraped-away bark and poisonous substances inside. It is suspected that they want to secretly kill the trees to turn the area into cultivated land. "After 15 days, no matter how strong, how big the trees are, they will wither and die," Thoi said. Dau Tieng Forest covers 18,885 hectares, has complex terrain that spread across many villages and communes near the border. Many people have encroached upon the forest to set up rubber plantations, cassava fields and fruit gardens. Meanwhile, the forest ranger unit doesn't have enough personnel to oversee the forest. They have found branches that had been cut or burnt before. Nguyen Van Cu, deputy head of the management team of Dau Tieng Forest, said a recent tornado in Binh Phuoc Province had swept away and damaged thousands of tree trunks at pepper gardens. As demand increases for African mahogany trees to plant so that pepper vines can cling onto, many people crossed Sai Gon River illegally cut down the trees. On February 15 and 16, Cu said 658 African mahogany trees were cut. Tay Ninh Forest Ranger Unit asked the Tan Chau District Forest Ranger Unit to work with the forest management board to tighten monitoring activities. In the coming time, the provincial authorities will set up a special force ranger to up the protection of the forest.